Most of the Japanese green tea is steamed to stop its oxidation. But some areas, especially in Kyushu area, pan-firing method is used instead of steaming. This called “MIYAMA” is one of the "kama-iri (lit; kama=pan, iri=firing)" tea produced by Mr Kajihara in Kumamoto prefecture, Kyusu area. 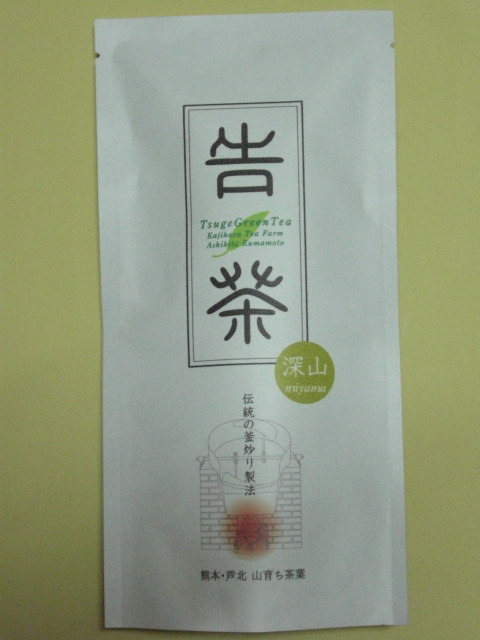 The tea plant used for "MIYAMA" was grown from seed in the wild mountains. We call this "zairai", or wild tea. Since the cutting, or ready-made plants are often seen recently, the production of wild tea. or grown from the seed are very small throughout the nation. After the leaves are plucked, they are withered a bit. which can add a bit of extra aroma. Since most of Japanese green tea don’t require withering process, withered green tea is still rare in Japan. - Pan-fired tea is special as Japanese green tea. - Wild tea is not that common.